Enterprise with foreign investments McDonald’s Ukraine Ltd. (Kyiv), which develops the American chain of McDonald’s fast food restaurants in Ukraine, has opened its first restaurant in Ternopil located at 30, Hetmana Mazepy Street. The press service said that the new restaurant with 112 seats indoors and 128 seats outdoors is located in a one-story building with an area of 520 square meters. Around 100 employees service some 2,000 clients every day. The restaurant has the McDrive service. The McDonald’s restaurant in Ternopil has become the ninth restaurant of the new format in Ukraine. The first McDonald’s outlet in Ukraine opened in Kyiv on May 24, 1997. Enterprise with foreign investments McDonald’s Ukraine Ltd. develops the chain. Enterprise with foreign investments McDonald’s Ukraine Ltd. (Kyiv), which develops the American chain of McDonald’s fast food restaurants in Ukraine, has introduced the option of full table service in a restaurant at Pivdenny Railway Station in Kyiv, which became the fifth establishment of the new format. 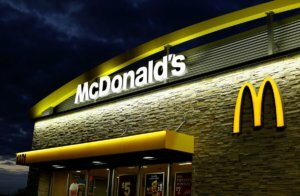 According to the company, McDonald’s intends by the end of the year to open seven more McDonald’s establishments of the new format. According to the press service, the restaurant of the network at Pivdenny Railway Station started work at the end of 2016. After reconstruction, self-service terminals were installed in it, table service was introduced, the cash zone was divided into two parts – for ordering and receiving dishes. A hospitality expert will work in the updated McDonald’s, who should notice and respond to customers’ needs. “In the second half of 2018, another element of the format of future experience will be introduced – a new principle of the kitchen “Cooked for you.” This will allow visitors to add or remove ingredients in burgers to their liking,” McDonald’s said. According to the press service, the new formats in 2018 were also introduced in four restaurants of the network: two in Kyiv, one in Cherkasy and Boryspil (Kyiv region). The first McDonald’s restaurant in the country opened in Kyiv on May 24, 1997.